Rib Hut has the greatest ribs in the world, according to Robert, 11. Actually, it does. From the moment you step into the country-charmed ski chalet, you immediately smell the jaw droppingly delicious barbecue sauce. 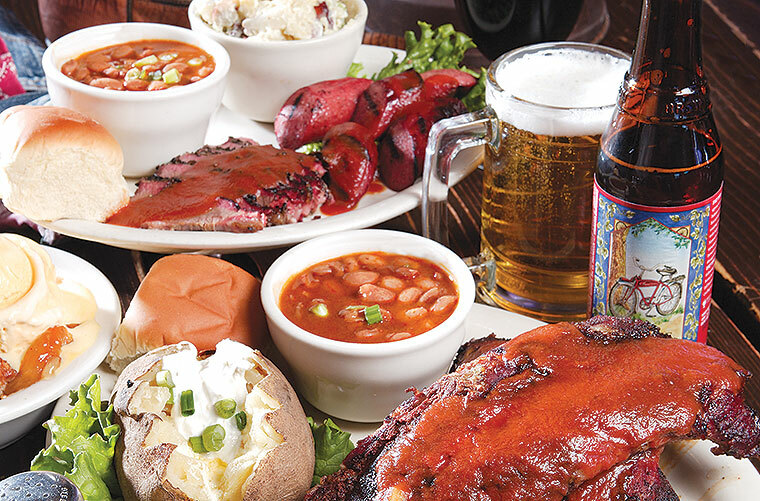 Barbecue at its finest, quality beef ribs, pork baby back ribs, sausage, and lean brisket so tender it melts in your mouth. There is a certain zing about Rib Hut's sauce that gives it so much flavor. The ribs and brisket cooked for hours are the showstoppers. All BBQ platters are served with your choice of two sides: beans, potato salad, cole slaw, baked potato, curly fries, steak fries, mac and cheese, dinner salad, or veggie of the day. The sweet potato fries and fried okra are awesome! Enjoy fried veggies, wings, jalapeño poppers, gourmet onion rings, or cheese sticks to get you started. Order an ice-cold beer like Fosters or Heineken, or choose from many others. Selections galore, including sandwiches and burritos, make a quick and hearty meal. The portions are giant. Choice steaks are served with heavenly results. Enjoy a 16-ounce T-bone or an 8- or 12-ounce rib-eye, grilled to your liking. Also, when you order a steak you may now choose any three sides. Oh, the chicken. There are chicken strips, chicken quesadillas, smoked chicken, or the Rib Hut Chicken Salad — amazing. The Santa Fe Chicken Breast is charbroiled to perfection, smothered with roasted Mesilla Valley green chile and white cheese and served with avocado. Don't forget the Chicken Fried Steak, a west Texas delicacy. Feast on homemade Black Angus steakburgers with your choice of fresh sautéed jalapeños and onions or lettuce, pickles, onion, and tomatoes. Yum! Everyone who tries the fried catfish comes back later, ordering more. There is also a veggie whole wheat pita for the veggie lover in your life. Moving on to dessert, try one of our homemade cobblers: peach, cherry, apple, and the "cannot miss" blueberry with vanilla ice cream melting like hot lava. It is the perfect balance of sweet and flavorful — better than Grandma's. You will love the root beer float, cheese cake, or a hot fudge brownie sundae. A kids menu and family packs are on call, which serve three to five people. Let us cater your next affair. Your catering experts are here. With such an enormous menu, everyone is satisfied. This is why Rib Hut has been serving quality food with genuine neighborly service and a smile since 1981. Located in the heart of the Cincinnati Entertainment District. Everyone feels at home here. Open Mon.–Sat. 11 a.m.–10 p.m., Sun. 12–9 p.m.
Visit the new Eastside location and enjoy over 70 types of German beer. Hours: Sun. 11 a.m.–9 p.m., Mon.–Thurs. 11 a.m.–10 p.m., Fri. & Sat. 11 a.m.–11 p.m; 915-313-5410.